Ballyscullion 1787 and all that.. The coloured sketch below is what Bishop Hervey's Palace in Ballyscullion would have looked like had it been fully completed. The central rotunda was virtually completed but circa 1803/1804, it was almost completely dismantled to avoid the alleged application o f the 'window tax'. 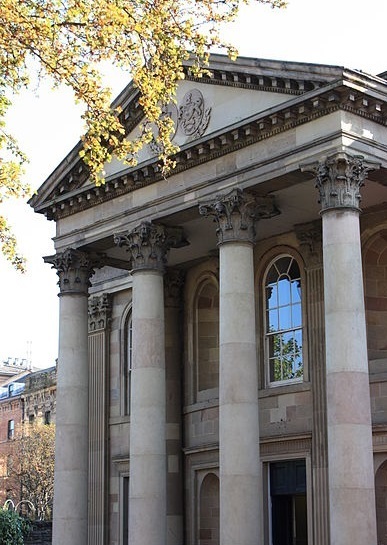 The portico at the front entrance door was taken away to Belfast where it can be seen to this day (see right) adorning St George's Church in the 'High Street'. The Ballyscullion house was apparently based on the contempory (1774) house on Belle Isle, Lake Windermere. This Belle Isle house (which still remains) was very probably based on the Pantheon or the Villa Vicenza in Rome. The Ballyscullion 'Palace' was, in its turn, to be the prototype for Ickworth House in Suffolk - the Hervey family seat. Below is the 18th century architect's vision of what the Ballyscullion Palace should look like after it was built (with the above portico integrated into the rotunda entrance! ).